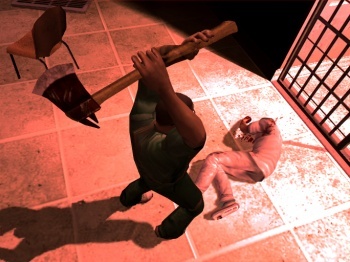 The most violent, bloody, and gross version of Manhunt 2 ever will be available on the PC within a week. Manhunt 2 has already been released for the Wii, PSP, and PlayStation 2, but not in the way intended by its developer. Originally given an AO (Adults Only) rating by the ESRB, the game had to be toned down to receive an M (Mature) rating so that it could actually reach retail shelves. Retail will generally not touch an AO rated product, most likely to avoid the associated controversy that could come from any number of directions. If you were going to buy Manhunt 2, but just couldn't stomach purchasing a censored product, the full-on Adults Only PC version will be coming to Direct2Drive on November 6, 2009. It was hinted at back in August that an AO Manhunt 2 would release on the PC somehow, somewhere, and Direct2Drive appears to be the distributor willing to take the chance on it. There are actually a few other AO-rated games already available on Direct2Drive, so this isn't a first for the the service. It certainly is easier to release AO games through digital download services, because these tend to get little to no attention from politicians and the like. Manhunt 2 follows the story of Dr. Daniel Lamb as he kills the crap out of lots of people in an insane asylum. I can't really see the AO-rated version of the game being a huge seller, because most gamers tend to care about really good games rather than graphic violence. The game received mixed reviews when first released, possibly due in part to its graphic nature that may not have sat well with some reviewers. I would personally prefer that it actually be somewhat censored, rather than to give me gruesome nightmares, but I can barely watch a horror movie so I am not the game's intended audience. One positive of Manhunt 2 going up as a digital download is that it will probably go on sale for really cheap sometime soon. Currently priced at $29.95, the AO version of Manhunt 2 can be purchased here.